Productivity and efficiency have been the traditional indicators of business health and performance. But what about Creativity? Does it lead to more business success? 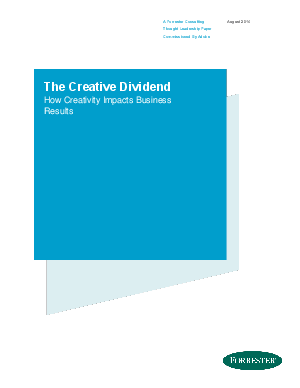 In other words, do companies experience a Creative Dividend? Adobe asked Forrester Consulting for help to answer the question. A new study shows that companies that embrace creativity outperform rivals in revenue growth and market share. Despite the perceived benefit of creativity, 61% of Senior Managers do not see their companies as creative.